At an early age, Keith and Nealy Frentz both had aspirations of someday owning a successful restaurant. Keith was born and raised in Covington, Louisiana and Nealy was born and raised in Southern California, then moved to Biloxi, Mississippi. Those dreams came true when they opened to doors of LOLA in Covington, Louisiana in January of 2006. Prior to the opening restaurant they both held Sous chef positions at world famous Brennan’s Restaurant on Royal Street in New Orleans. There, they each learned the ins and outs of fine dining kitchen culture and interaction with a variety of people. It was not until hurricane Katrina came when their reality of restaurant ownership would come true. They evacuated to Covington and one year later LOLA was born. Nealy was 23 and Keith 28. Keith and Nealy both graduated from the prestigious Johnson & Wales University with degrees in culinary arts which gave them the knowledge and fundamentals of understanding the kitchen. Together with family, schooling and kitchen life at Brennan’s has helped sculpt LOLA into what it is today. One of the best restaurants on the Northshore. They are always looking for room to grow and better the community. LOLA supports the farmers of the Covington farmers market as well as local seafood suppliers. We love to keep it LOCAL at LOLA. LOLA is located in downtown Covington across the street from the St. Tammany Parish court house. The building that houses LOLA is the city’s’ historic train depot. The kitchen is in an actual train caboose. All the original doors and brick make this restaurant very unique. Large crowds fill the restaurant for weekly lunch and weekend dinners. Whenever the chance, Nealy and Keith love to give back to the community. They donate their precious time to many local charity and non profit groups. On the first Monday of every month they donate large pots of red beans & rice to the “413” program of the Faith Bible Church dedicated to helping men with substance addictions. They participate every March in the Youth Service Bureau’s annual “Chef Soiree” benefiting several local youth programs. They give back to Keith’s high school, St. Paul’s School, every year for their annual fund raiser Jazz-n-Roll. Community involvement is very important to them. In six short years Nealy and Keith have racked up some big awards and recognition. 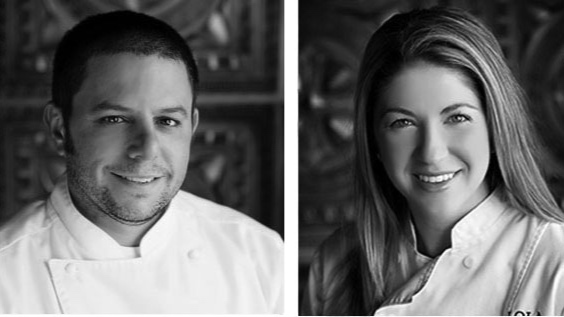 In 2009 they were both awarded the “Chefs to Watch” from Louisiana Cookin’ magazine. It was only the second time in its history that married chefs won the award. In 2011 they finished 3rd in the Louisiana Seafood Cook off, sponsored by the Louisiana Seafood & Marketing Board. They attempted the same cook off in 2012 and won 1st place. They were given the title of King & Queen of Louisiana seafood for the next year. With that title they were given the chance to compete in the Great American Seafood Cook off to represent the state of Louisiana. Fifteen other states also competed. After all the cooking and judging, Louisiana placed 2nd.Big win for Nealy and Keith, but an even bigger win for LOLA.